Happy May Day- Why do we want a bridge of love-light? A bridge of Love-Light is a simple and always available tool to take you to a higher frequency in your being. First in the very refined energy of your mental body, then filtering down through your emotional body and finally to the physical part of you. The bridge of Love-Light is your Spiritual body, which is always connected to your Creator Source, Divine Love. When you activate a bridge through joy, laughter, singing, loving, being yourself, playing, jumping, art, seeing beauty, sunrises, sunsets, tea parties, herbs, nature, travel, fairies, crystals, meditation or your favorite activities you increase your ability to focus on your highest good. These Love-Light bridges activate memories of your spiritual talents and abilities. You become inspired. They activate peace and harmony within you that leads to peace and harmony in your outer world. In this peace you attract and allow your GOOD! Photo by Nina Wilkins, May Day, 2018. Crystals are a beautiful bridge to well-being and light. 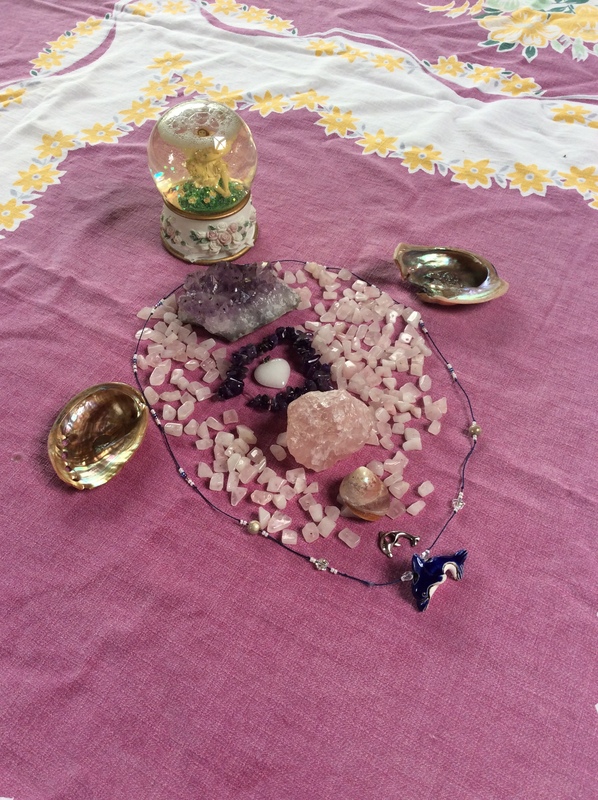 I created this simple mandala out of rose quartz (pink), love, amethyst (purple) spirit, Abalone rainbow love from the ocean, Sacred spiral shell, white quartz heart for our innocence, Dolphins for fun and our fairy globe for healing the Earth and ourselves.